"So then what did you do? DNA!" Thank You to all who helped out to make this another fantastic event. Mary Kay Killian – $25 Gift Certificate to the WMGS Sales Table. Donated by WMGS Sales Table. Judy Wilson – 6 months subscription to Ancestry World Edition. Donated by Ancestry.com. John Nelson – 1 year subscription to footnote.com. Donated by footnote.com. Valerie Dale – Megan Smolenyak Smolenyak In Search of our Ancestors. Donated by Megan Smolenyak Smolenyak. Beth Kleersnyder – Mini-Binder of your choice. Six ring 7 1/2″ x 5 1/2″ binders in an assortment of colors. 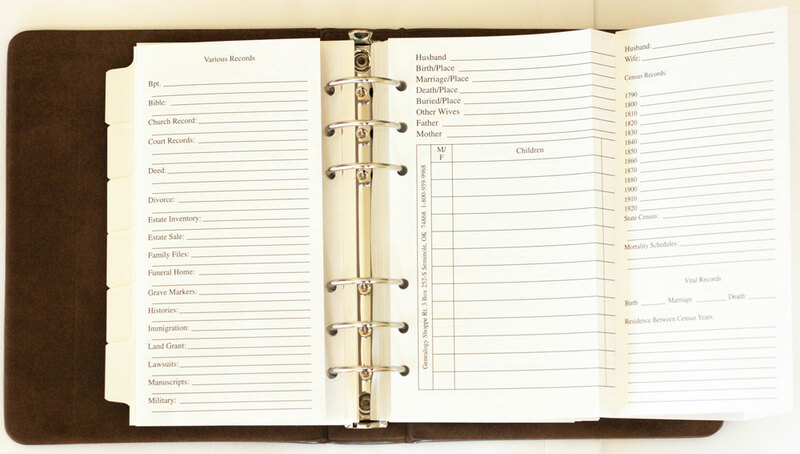 The binders contain 30 Family Group Sheets, 10 Lineage Charts and 6 tabbed dividers. Donated by WMGS Sales Table. Charlynn Bailey – Tee shirt of her choice. Donated by Fun Stuff for Genealogists. Diane Rider – A voucher for any 11″ x 14″ colour map. Donated by Michiana History Publications. Pam Warren – 1 year subscription to Ancestry World Edition. Donated by Ancestry.com. Sheryl Tisdel – A copy of the MagiKey with Census Tracker software provided by MagiKey Family Tree. Judy McGhee – 1 year subscription to footnote.com. Donated by footnote.com. Sue Haadsma-Svensson from Indianapolis, Indiana was awarded a $25 Shell Petrol Card to help with the cost of the 281 mile drive each way she made. THANKS!!!!!! to all who donated the Door Prizes. 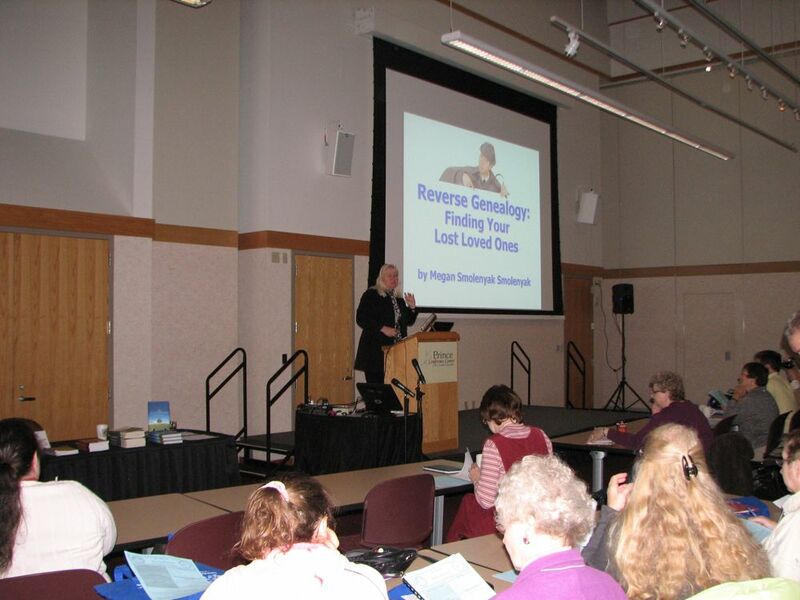 We had a GREAT day Saturday with 4 very informative and entertaining sessions presented by Megan Smolenyak Smolenyak. 110 people (± 2) heard talks about Reverse Genealogy, DNA, the story of Annie Moore – the first immigrant ashore at Ellis Island, and Cases that made Megan’s Brain Hurt – now as I noted, she has some genealogical brain, so if her brain hurt imagine how we’d have done. Got Ancestors?! 2010 is underway. Megan arrived in Grand Rapids this afternoon, and after a quick trip downtown to have “Michigan’s Best Burger” and a stop by the Gerald R Ford Presidential Museum and his final resting place beside the Grand River, it was off to the Prince Conference Center at Calvin College for Megan to relax a little (she’d got up at 4AM to come to Grand Rapids) and me to make sure last minute details were all in place before tonight’s presentation of Michelle Obama’s Roots“. It was a GREAT presentation – if you weren’t there you surely missed a great story – special because it’s about the first person (and her mother and daughters) who are descended of slaves to live in the White House, but that aside fascinating as a story of research into people in different parts of “the South” that descend from slaves and their migrations after emancipation. 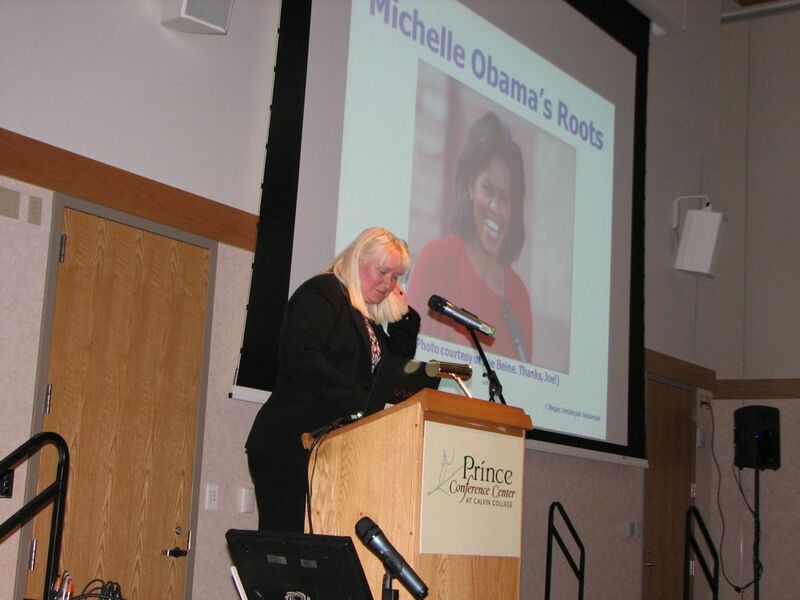 Megan Smolenyak Smolenyak presents "Michelle Obama's Roots"
Well we’re in the final countdown to Got Ancestors?! Are They Who You Think They Are? on Friday night and Saturday with Megan Smolenyak Smolenyak. It’s still not too late to register for either event – we still have space available. Please use the online registration system to let us know that you’re coming, and if possible pay by PayPal. 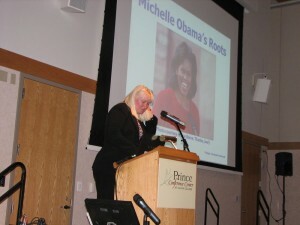 If you want to pay by cheque or cash, by all means choose that option on the payment page, but please DO NOT mail your cheque – instead bring it with you on Friday if you’re coming to Friday evening’s Michelle Obama’s Roots session or on Saturday if you’re only coming to Are They Who You Think They Are?. Online registration for GotAncestors?! — "So Then What Did You Do? DNA!" is now closed. There are a limited number of spaces available for walk in attendees to register on Saturday morning.